The Grand Prix MX3 Pocket Bike is the ultimate replica of its bigger GP motorcycle sibling. The Honda®-Based 4-STROKE race-tuned engine is not only more gas friendly, it requires no mixing of oil and fuel, yet provides superior power and much quieter operation. The MX3 pocket bike also features a Computer Aided Design (CAD) tubular racing frame, full fairings, dual fenders and a redesigned aerodynamic profile. The hand welded racing frame on this pocket bike is one of the stiffest on the market, thanks to key braces on the main frame. Treaded Racing Tires on black rims provide maximum grip on all paved surfaces while the next-generation Bio-Disc brake system expels moisture for rapid deceleration in all conditions. Handling prowess comes from a low center of gravity and near 50/50 weight distribution for unrivaled track performance. 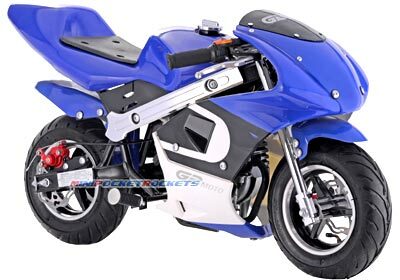 Adjustable top speed regulator, handlebar angle, throttle / brake sensitivity and racing tire air pressure allows the pocket bike rider to fully customize this bike for racing. The MX3 pocket bike comes virtually fully assembled and ready to ride right out of the box. Just add gas, make a few adjustments and go! Included Free with Pocket Bike: Pocket Bike Kick Stand, Tools, Tool Case, Owner's Manual, Starter Stickers and our free extended warranty.